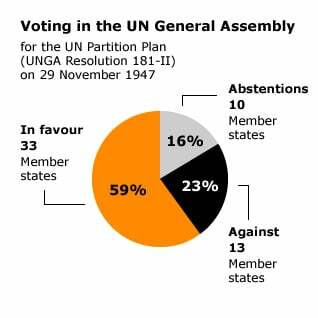 On 29 November 1947 the United Nations General Assembly voted (UNGA-Resolution 181-II) a Partition Plan that recommended the division of the British Mandate of Palestine into two provisional states, one Jewish and one Arab. This plan provided for a Jewish state on 56.5 percent of the territory (excluding Jerusalem) with 480,000 Jewish and 497,000 Palestinian inhabitants (the Bedouin community included), and an Arab state on 42.5 percent of the territory (excluding Jerusalem) with 725,000 Palestinian and 10,000 Jewish inhabitants. 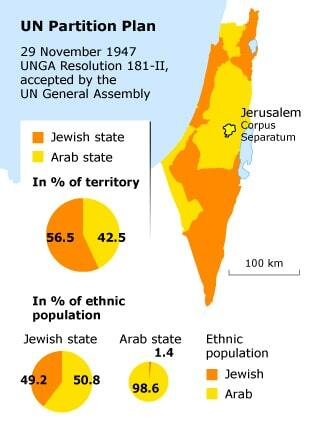 The Partition Plan also provided for an international trusteeship for Jerusalem as a Corpus Separatum. The General Assembly accepted the Resolution with 33 Member States (59 percent) in favour (Australia, Belgium, Bolivia, Brazil, Belorussian SSR, Canada, Costa Rica, Czechoslovakia, Denmark, Dominican Republic, Ecuador, France, Guatemala, Iceland, Luxembourg, Netherlands, New Zealand, Nicaragua, Norway, Panama, Paraguay, Peru, Poland, Sweden, South Africa, Ukrainian SSR, United States of America, Soviet Union, Uruguay, Venezuela, Haiti, Liberia and Philippines), 13 Member States (23 percent) against (Afghanistan, Cuba, Egypt, Greece, India, Iran, Iraq, Lebanon, Pakistan, Saudi Arabia, Turkey and Yemen), and 10 abstentions (the remaining 16 percent) (Argentina, Chile, Republic of China, Colombia, El Salvador, Ethiopia, Honduras, Mexico, United Kingdom and Yugoslavia). On 14 May 1948, one day before the British Mandate for Palestine was to end, the State of Israel was unilaterally proclaimed. It was the tipping point for a situation that was already explosive. There had been skirmishes between Jewish and Arab fighters in the years before the UN-decision had been made, but everybody realised that soon the gloves would be off. Shootings and attacks on Arabs and Jews, on armed men and civilians, increased in frequency. The scale of these clashes also increased. Arab forces sought to isolate Jewish villages and towns by cutting-off roads leading towards them and attacking convoys with supplies and personnel. The day after the proclamation of Israel, the first war between Palestine and the neighbouring Arab countries, on the one side, and Israel, on the other, erupted. The War of 1948 (‘The Nakba’ according to the Palestinians, ‘The War of Independence’ according to the Israelis), was only the start of a series of large scale conflicts that were to follow: from the 1956 invasion by Israel, Great Britain and France after the nationalization of the Suez Canal, to the 1967 June War and the 1973 October War to the recent wars of Gaza of 2012 and 2014.. In effort to find a peaceful solution to the conflict, countless rounds of negotiations between the warring parties have taken place unsuccessfully, increasing the frustration of the Palestinian population ever more stifled by the Israeli expanding occupation. The widely held view in the West that after the creation of the State of Israel in May 1948, Arab leaders were not willing to negotiate a solution to their conflict with Israel, is not based on facts. From the start several Arab leaders tried to negotiate behind the scenes, among them the new leader of Egypt, Gamal Abdel Nasser, in 1953. Although in the Arab world the Zionist project in Palestine was – and still is – seen as a colonial enterprise, supported by imperial powers aiming to control this strategic part of the world, the efforts of several Arab leaders to deal with Israel were only motivated by raison d’état. 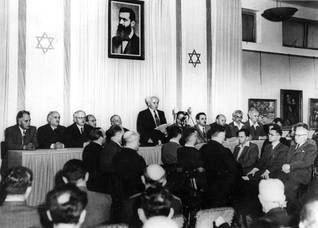 The presumed lack of willingness on the Arab side to deal with Israel is therefore a myth which – as documented by the prominent Israeli publicist Simha Flapan (1911-1987) – has been successfully promoted by Israel’s respective leaders, who, in fact, themselves were not prepared to start serious negotiations with the Arab neighbour states. After all, such negotiations would focus on Israel’s withdrawal from territory it had conquered in addition to what the UN Partition Plan had designated to it (including Eastern Galilee, West Jerusalem and the Negev). Following its establishment, Israel de facto controlled 78 percent of the territory of the former British Mandate of Palestine, 22 percent more than the Partition Plan had foreseen. Negotiations would also have focused on the return of the approximately 750,000 Palestinian refugees who had fled the fighting that had in fact started well before the State of Israel was proclaimed and continued until early 1949. Many of these refugees had been expelled by the armed forces of the Yishuv (the pre-state Jewish community in Palestine) and the Israeli army, in a targeted campaign aimed at the expulsion of the native Palestinian community and the creation of a solid Jewish majority in the State of Israel. Already before the end of the war, UNGA Resolution 194 of 11 December 1948 had stressed the Right of return and of compensation of Palestinian refugees. In the same resolution, the special position of the Holy Places in Jerusalem (the western part of the city had already been conquered by Israel) and Bethlehem was again mentioned – places that according to the Partition Plan were to become part of a Corpus Separatum, under a special international regime and administered by the United Nations.